Texas, which is home 28.7 million people, takes the number 1 spot for the “most polluted” state in southern America and Houston ranks in the top 10 most polluted cities in the United States. These rankings are calculated where littering and dumping are visible and widespread, and where record-high fatalities are attributed to litter pollution related accidents. Yes, you read that right, trash in our roadways contributed to fatalities. In fact, the National Highway Traffic Safety Administration identified over 100 deaths in 2016 where collision with litter was listed as the cause of death. Furthermore, these rankings are evaluated through governments, nonprofits, and private sources including tips from citizen-observations, deaths and vehicle accidents from collisions with rubbish, and criminal delinquents doing community service. With the population continuously increasing, litter is becoming an environmental emergency in Texas. When not properly disposed of, litter makes its way to our waterways through ditches, bayous, and rivers, and then eventually ends up in our oceans. Currently, there is so much trash in the ocean, that there exists a giant floating garbage patch twice the size of Texas. Additionally, this same litter pollution is clogging up our ditches, causing water to back up and not properly drain thus increasing the chances for more homes and business to flood. Flooding in south Texas is a significant economic concern; reducing the amount of litter pollution can have a drastic decrease in the amount of financial loss during these high rain events. Not only is litter pollution harmful to our environment and economy but many polluted areas attract insects and diseases that breed in decaying litter, causing major health concerns for animals and people. 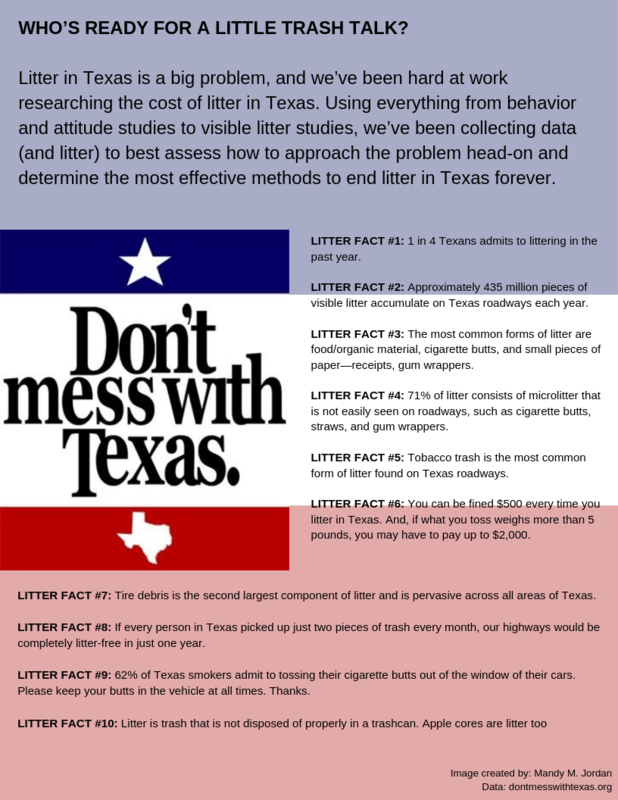 Despite educational campaigns, such as Don’t Mess with Texas, created to reduce littering, trash continues to be found in roadside ditches, parks, kid’s sports arenas, parking lots, and other public spaces. So how can we reduce littering and improve our community environment and overall state environment? separate each community and study how these different areas view litter pollution and their environment and then form awareness campaigns specific for each individual city, county, or community, these environmental awareness campaigns that aim to reduce littering may have better success. Additionally, research has shown there to be generational differences in respects to the environment, media communications, technology, and even culture. Therefore, further generational cross-cultural ecology research could have greater impacts than even looking at individual communities. Individual public campaigns geared towards each different age group such as elementary and middle schoolers, high schoolers and college students, parents and working adults, and then the baby boomer generation could have a more benefiting and positive promotional campaign for reducing litter pollution. Another theory to reduce litter in Texas communities is to focus on a more political ecology outlook where ethnographers study the relationships between littering and economic and social factors and help politicians create better laws to reduce littering in Texas overall. Through political ecology, ethnographers can research how many litter related tickets were issued and then talk to residents with the highest amount of litter related tickets and the lowest amount of litter related tickets to better understand each communities perception on litter pollution and if the laws that are currently in place are working or need to be reevaluated. Currently, you can be fined $500 every time you litter in Texas. Moreover, if what you throw outweighs more than 5 pounds, you may be fined up to $2,000. However, as we noted above, Texas still has the highest rate of trash pollution in the United States, so we know that setting laws and fines are not enough until our police officers crack down on offenders. Another incentive could be to award citizen tippers who notify authorities if they observe someone who is littering, this would be especially useful for large dump items at illegal dump sites. We as a whole need to realize there is no gray area when it comes to litter pollution and taking on a utilitarian environmental outlook where all Texans know and understand that littering is wrong may be easier said than done. Utilitarianism, in the most basic form is the theory that something is either right or wrong and that by doing the right thing or not doing the wrong thing the world would be a better place. Truthfully, I would argue most if not all Texans would already say littering is wrong and not littering would make Texas a better place. However, what is our ethical duty to our environment in terms of litter pollution? ​In Santa Fe, Texas, pride in our individual community is strong. Taking the utilitarian outlook further and combining it with both a cultural ecology and political ecology viewpoint could have the greatest impact, especially for a community so driven to be stronger, more beautiful, and more engaged than the communities that surround us. In an effort to increase engagement, Santa Fe recently hosted a clean-up competition event. The idea was to see which community would have the largest number of volunteers turnout and which community collected the most trash. During the event Santa Fe had 73 volunteers come out on an early Saturday morning to collect litter from parking lots, ditches, and community areas such as parks. During this four-hour clean-up, more than 60 bags of trash were collected filling nearly two dumpsters. A great deal of the trash collected was cigarette butts, food wrappers, drink containers such as cans and cups, and straws and straw wrappers. Our competitors, nearby Dickinson, Texas, had over 120 volunteers and cleared nearly twice the amount of trash. While Santa Fe took that as a win all around with record numbers of volunteers coming to help and having less trash than nearby Dickinson, the event leader and researcher noticed that instilling a dose of friendly fun competition proved for a successful event in both cities. After the event, I wanted to look deeper into littering in Santa Fe. To better understand how litter is impacting our small community of Santa Fe, Texas I spoke with a small sample of residents and asked them some open-ended qualitative questions to help better understand the litter problem in our community. Do you think our community has a litter problem? All ages and genders unanimously answered yes. 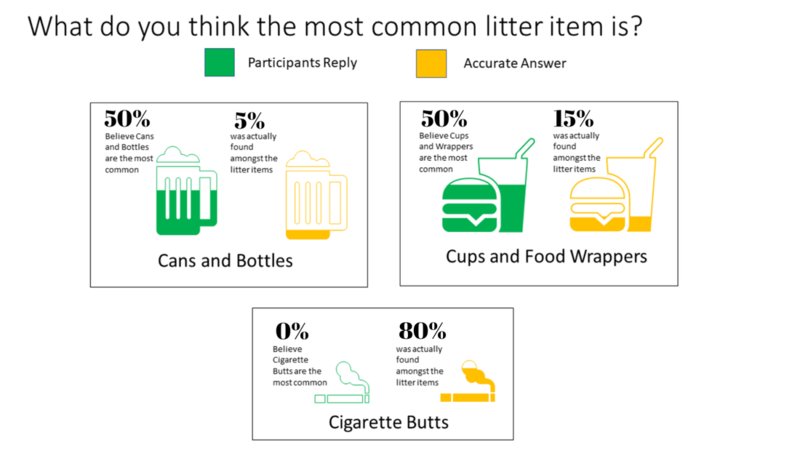 What would you say is the most common litter item found in Santa Fe? All ages and genders believed cups and cans are the most common item. 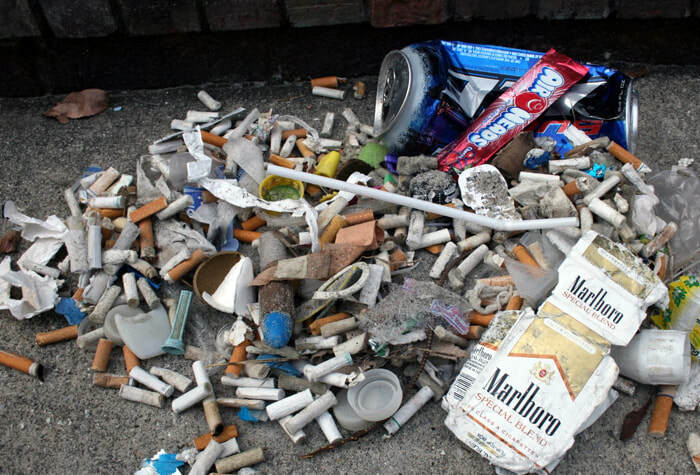 However, the most common item collected in the last clean-up was cigarette butts. 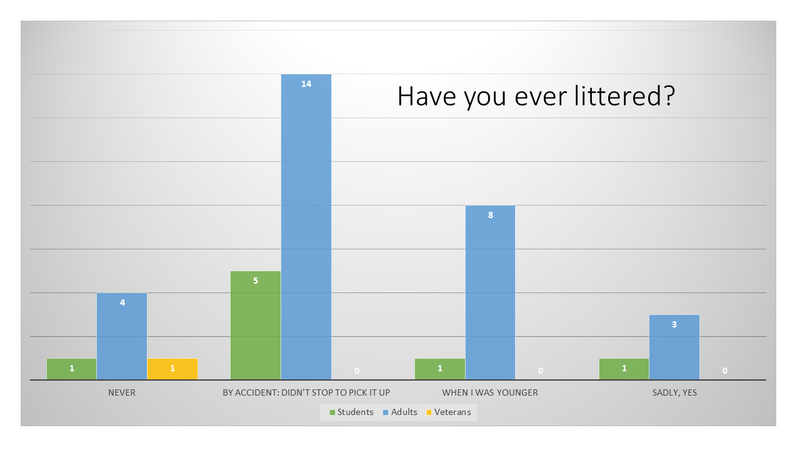 Many students in Santa Fe claimed to have never littered or only accidentally dropping trash and failing to go back and pick it up; whereas many adults say they littered when they were younger. What makes this more interesting is that research shows Texas has more “profiled teenage litterers” (age 16 to 25) than any other state. Either this means the students that participated in this research were too embarrassed to admit they had improperly disposed of trash or the young adults in Santa Fe are more environmentally conscious and aware than other places in the state. To accurately identify this answer, more research will need to be done. These responses were collected at a Santa Fe community potluck, visiting participants where they felt most comfortable, and on social media. Santa Fe, Texas has a population of 13,202. 39 residents participated in this survey. 35% of the population of Santa Fe is made up of students; 8 of the 39 participants were students who participated with at least one parent. 86.4% of the population is Caucasian, 11.2% is Hispanic, and the remaining 2% identifies as other including African American, Asian, and American Indian. Of the 39 participants, 38 were Caucasian, and 1 was Hispanic. 9% of the population identifies as a veteran; therefore 1 of the 39 was a vet. This project was internally done for a Master of Science Environmental Anthropology course through the University of North Texas. The idea of looking at litter pollution from an individual community’s perspective is new, keeping in mind that no one to date has attempted a comprehensive investigation of littering affecting state-oriented environmental quality using qualitative and quantitative analysis. Also, no one has yet to conduct national research quantifying the extent of environmental crimes such as littering through ethnographic research. Perhaps future research can take what was started in Santa Fe, Texas and go much further and deeper eliminating the current condition of inattentiveness towards litter pollution in Texas overall and eventually the Nation. Furthermore, researching environmental anthropological theories such as cultural ecology, political ecology, and environmental utilitarianism, especially in relation to public campaign messages created to reduce and prevent littering, could have a rather large impact on how individuals view litter pollution. With more research to creating an extensive campaign approach, litter pollution can drastically decrease - therefore improving the environment, the aesthetics of each individual community, reducing the economic burdens of flooding, improving community health and eliminating the amounts of deaths due to vehicular collisions with trash. Would you like to help us with similar future research? Litter pollution like this was found near areas where people come together, work, and children play. Together we can work to eliminate the litter pollution in Santa Fe and create a safe and beautiful community. Silverman, Jacob. "Why is the world's biggest landfill in the Pacific Ocean." Retrieved from Web site, How Stuff Works on September 19 (2007): 2007. Al-Mosa, Yara, Joy Parkinson, and Sharyn Rundle-Thiele. "A Socioecological Examination of Observing Littering Behavior." Journal of Nonprofit & Public Sector Marketing 29, no. 3 (2017): 235-253. Nazarea, Virginia D., ed. Ethnoecology: situated knowledge/located lives. University of Arizona Press, 1999. Syme, Geoffrey J., Elisabeth Kals, Blair E. Nancarrow, and Leo Montada. "Ecological risks and community perceptions of fairness and justice: a cross‐cultural model." Risk analysis 20, no. 6 (2000): 905-916. Robbins, Paul. Political ecology: A critical introduction. Vol. 16. John Wiley & Sons, 2011. Hodgson, Geoffrey. "Economics, environmental policy and the transcendence of utilitarianism." In Valuing Nature?, pp. 60-76. Routledge, 2002. Foxall, Gordon R., Jorge Oliveira Castro, Victoria K. James, M. Mirella Yani-de-Soriano, and Valdimar Sigurdsson. "Consumer behavior analysis and social marketing: The case of environmental conservation." Behavior and social issues15, no. 1 (2006): 101-124. Residents of Santa Fe, Texas. "Litter in Santa Fe, Texas." Interview by Mandy M. Jordan. March 31, 2019. Spacek, Stephen L. "DO MESS WITH IT! : A sociopolitical study of littering and the role of southern and nearby states." (2004). 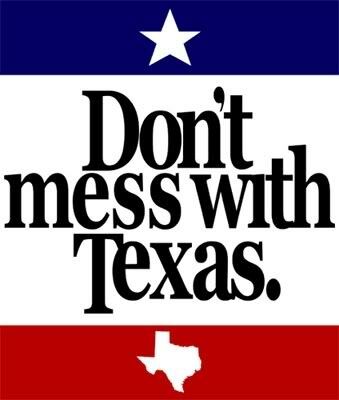 Don’t Mess with Texas. Survey by Don’t Mess with Texas organization. August 2 – 15, 2017. Bingham, Richard and Felbinger, Claire. Evaluation in Practice: A Methodological Approach, 2nd ed. Washington, D. C.: CQ Press, 2002.